New Canuck Workshop: Beall, Router Tables, etc. The beginnings of a Canadian woodworker learning modern and traditional techniques. Few things. The thread type in cut by the generic thread box is not the same as the thread cut by the Beall. This results in my Moxon Double-Screw being a bit shorter than specified in Popular Woodworking. The pitch on the Beall is a bit larger than with the thread box. I tried to re-tap the holes on the vise but it was only partly successful. I could thread the screw most of the way through, but by the far side of the vise, pitch was out enough to begin shearing the threads off the screw. I cut a pair of handles for the screws out of some hard maple scraps. This would be my first attempt at gluing up anything beyond screw covers. To say it turned into a horrendous mess would be an understatement. Thankfully the blocks were oversized enough to accept another round of milling to remove all the squeeze out. 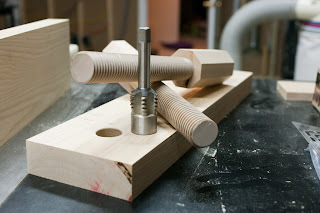 I bored out the handles on the drill press to accept the unthreaded dowel, but the new dowel from Beall was a bit smaller than the 1 1/2" hole, so i press fit the screw cut from my previous dowel, and screwed it in place. The boring operation was a bit off vertical for one of the handles for reason as yet undetermined. I checked the alignment of the table to the bit and it seems ok.
After all the fussing with the thread box, it was a pleasure to use the Beall threading system. 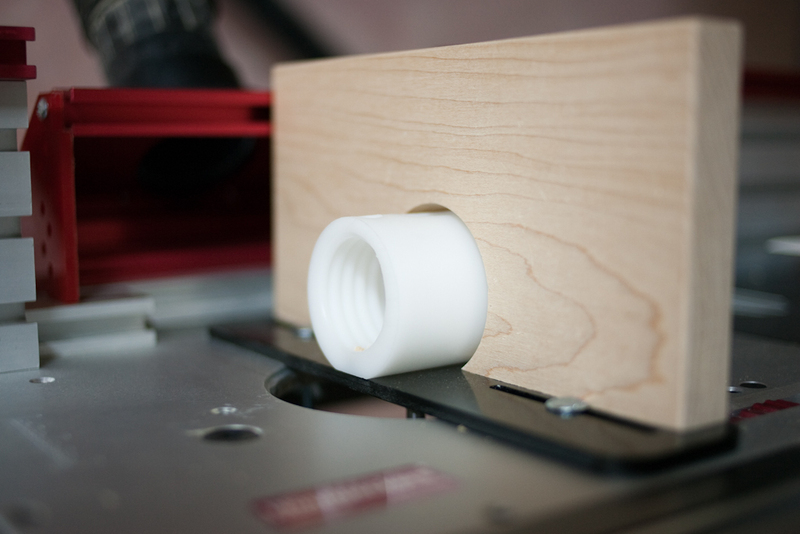 I know it's not supposed to be mounted to a router table, but I don't have a standalone router. It looks a bit odd, but it works great. Well, except for the dust collection. The chips are all rejected out the bottom (normally the top) of the Beall thread box, so the dust collection hood on the router table is pretty ineffective.